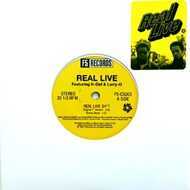 The fourth 7" from F5 Records features Real Live, K-Def and Larry-O's rare 1995 bangers "Real Live Sh*t", "Pop the Trunk" plus "Crime is Money", all on 7" for the first time. Murderous K-Def production on the tracks. A must for your golden age 45 set! Limited pressing of 400 in stickered jacket.